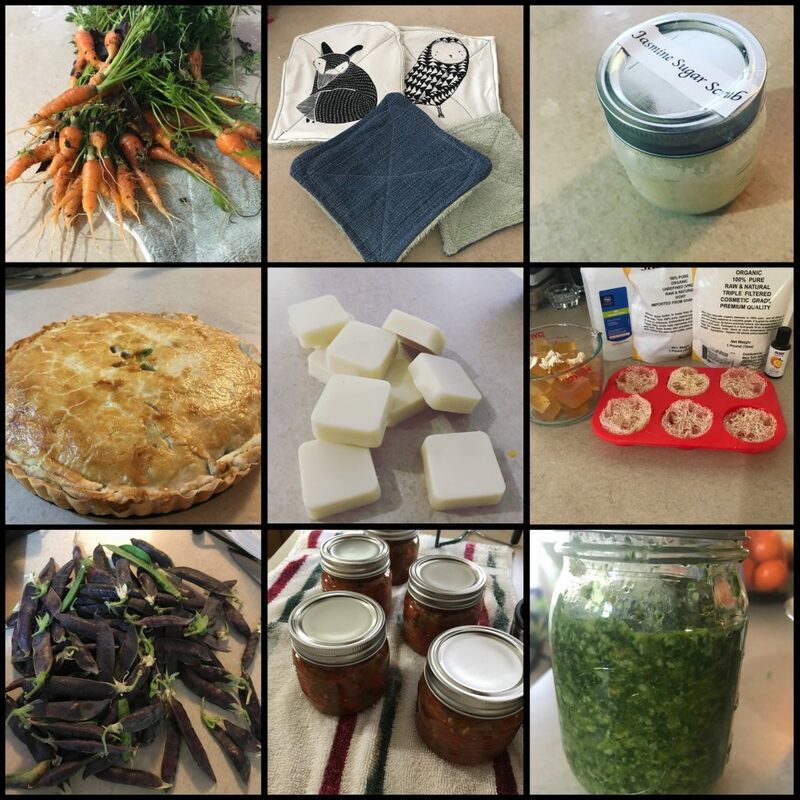 One way to begin was to start making a few things from scratch which included: brownies, bread, soft pretzels, wheat bread, salsa (from my own garden! ), hand made pasta, radish leaf pesto, and wild dewberry jam. One of the most important skills I learned was how to water bath can. I was scared at first but I went with safe, tested recipes and gave it shot. 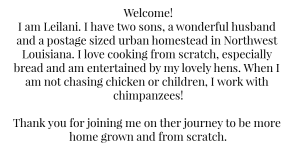 Finally, I worked on home made items such as sugar scrubs, lotion bars, unpaper towels and garden grown loofah soap. I started with a lofty five year goal and narrowed it into monthly chunks. The easiest way to achieve a goal is to break it down into smaller and smaller pieces that you can reasonably complete, which is especially helpful when trying to avoid burnout or overwhelm. What I found especially helpful was treating it like a bullet journal. If the harvest didn’t come in until weeks later, it just migrated to the next month. Or I would leave it as a reminder for next year or delete it if it became obsolete. Here is an excerpt below. It is not entirely comprehensive because it was made and modified over the year, on google docs. Crossing an item out was a nice way to mark an accomplishment. 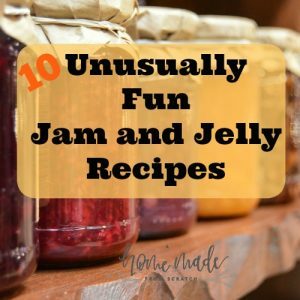 I would try to make several foods from scratch for fun and didn’t always remember to enter it either on google docs or in the garden/homestead journal. I also did several projects with the sewing machine such as a skirt (epic fail but no worries, trying again next year), unpaper towels, my 2 year old’s nap mat and a few pillow cases. They did not always make the list either but that’s ok! Though I didn’t make it to the quilt, there’s always next year! 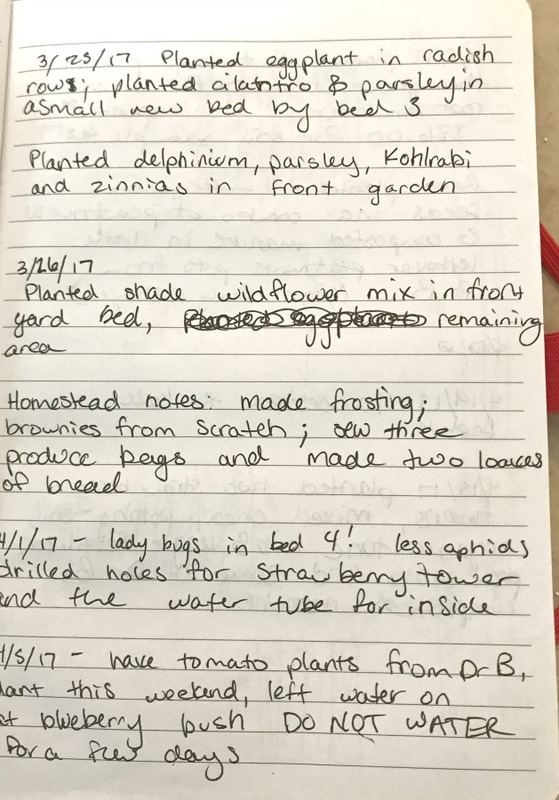 I decided to keep a garden journal. This chronicles what actually happened rather than the plan and includes a variety of notes on issues such as pests, heat and soil problems. It helps me see when I might expect those tomato assassins next year. Also when I might expect the extreme heat of summer to set in and make my west-facing garden a little more challenging. To be totally honest I started slowing around October. Mainly because the plants I did have in the garden were just ravaged by nasty little bugs that ruined almost all of my tomatoes! (I’m looking at you leaf footed beetle…grrr…). Also squash vine borer and root knot nematode! 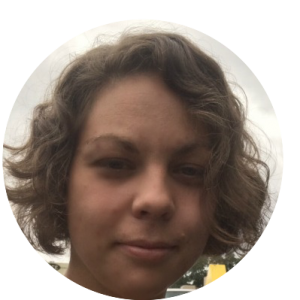 Really it is clear my ecosystem was a little stressed (may have been too ambitious on plant succession) and I didn’t have any chickens to help with some pest control…2018 I am ready for you! Expenses…oh how I love to to peruse and select (and then purchase) all of the things. 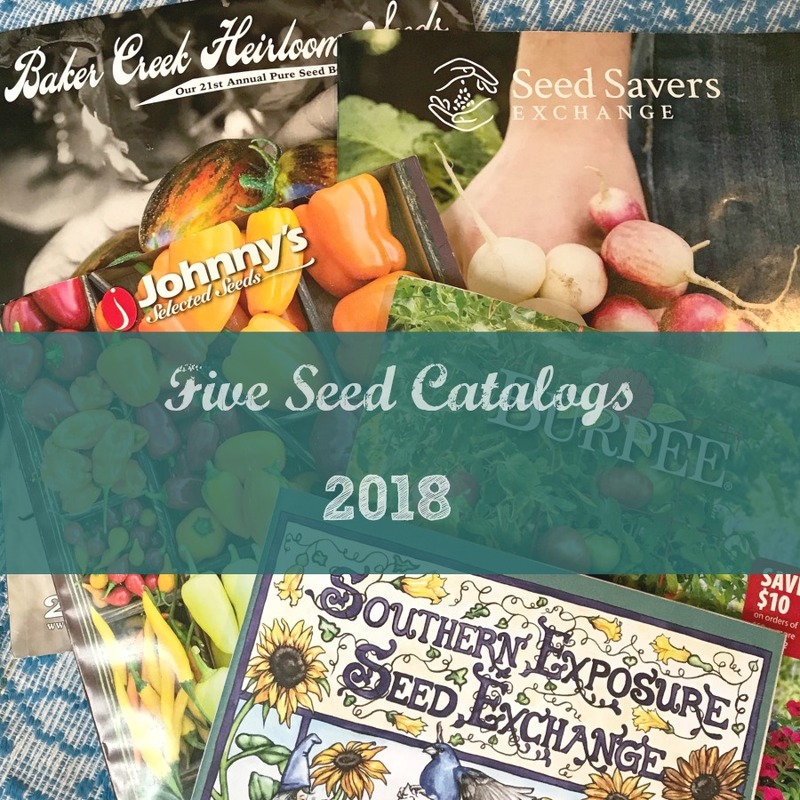 Seed catalogues are my new kryptonite. I tried to use funds from non traditional sources (benefits program through health insurance helped build another raised bed!) and then reuse anything I can. At the same time, I did realize I needed a few items that I could not produce yet in my little slice of heaven. Such as wood for a raised bed, PVC for a strawberry tower, seeds and plants from the local nursery. The end of the year total was close to $400. Importantly, this is limited to the garden which needed some serious work. Other expenses such as flour for bread or fabric for the quilt were not included in this particular budget. 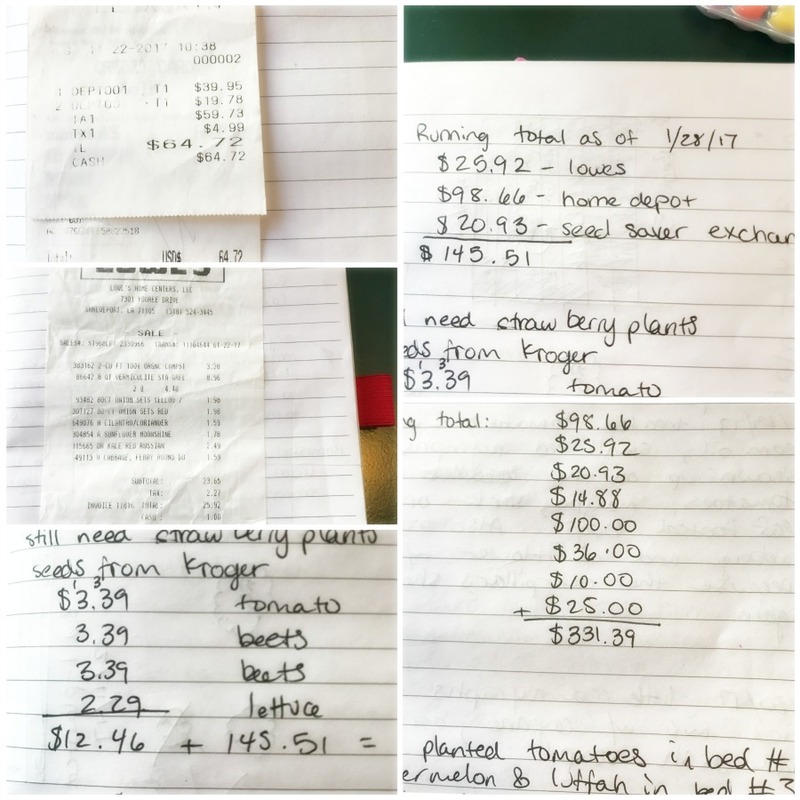 For items we use/need anyways, I only tried to replace them with cheaper home made items and considered those purchases to be part of the grocery budget. 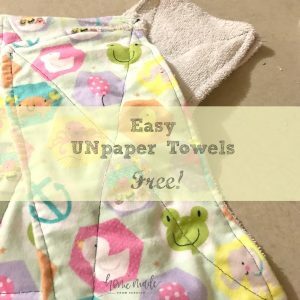 Toward the end of the year, especially as winter neared, I started to focus on homemade items such as laundry detergent and dishwashing pods. And I hand made many of the Christmas gifts this year, including lotion bars. This year I also became solidly comfortable with making my own bread and make it every other week as a regular part of the routine. 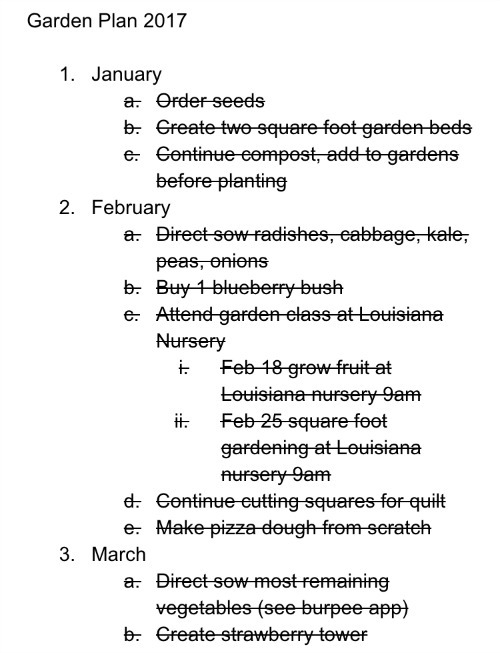 I really enjoy planning the next year because, at least on the dead of winter, the possibilities seem endless. Also I’m expecting four fuzzy bundles of egg production in April! 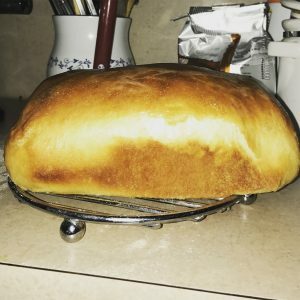 That was my first year officially trying to homestead, be more homemade and from scratch. I hope you enjoyed it! I had a great time trying so many things. 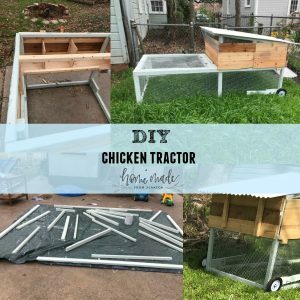 Some things I plan for 2018 are Homesteading Bujo, chicken tractor building, getting started with chickens and adding another from scratch staple. Look out for those! 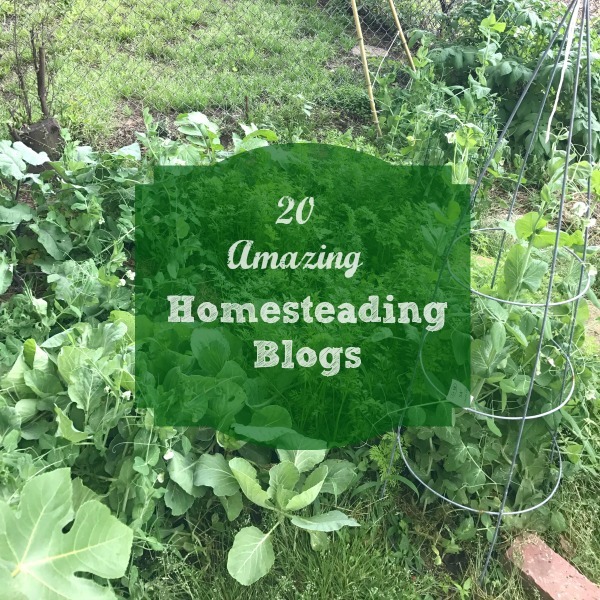 Leave me a comment about your experience beginning with homesteading. Thanks for visiting!